In a week where the once seemingly unassailable Barcelona conceded their first defeat in four years on their own turf and where Real Madrid were a goal shy from getting through to the final, there were some interesting aspects to pay attention to (please find the key to all the images at the bottom of the post). We will be starting with first match of the week - Real Madrid vs Borussia Dortmund. 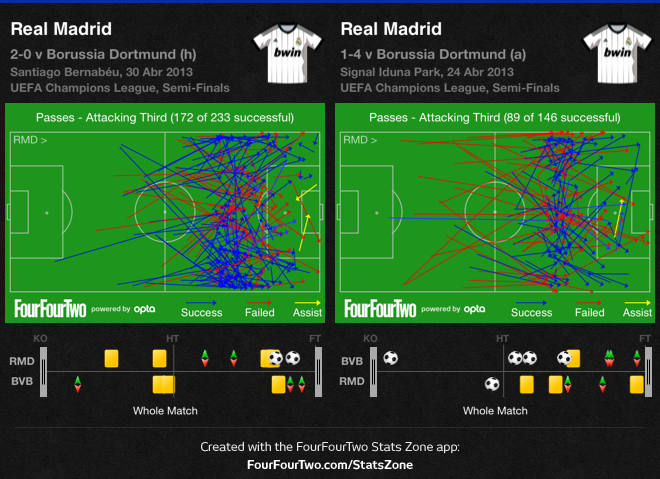 Real Madrid were much more proactive defensively, particularly during the first 20 minutes, when they managed to play higher and push Borussia Dortmund into their own penalty box. This, in turn, meant that the German team found it harder to get themselves into scoring positions, unlike the first leg, where they were allowed to shoot almost at will. Offensively, José Mourinho's team also looked quite different. 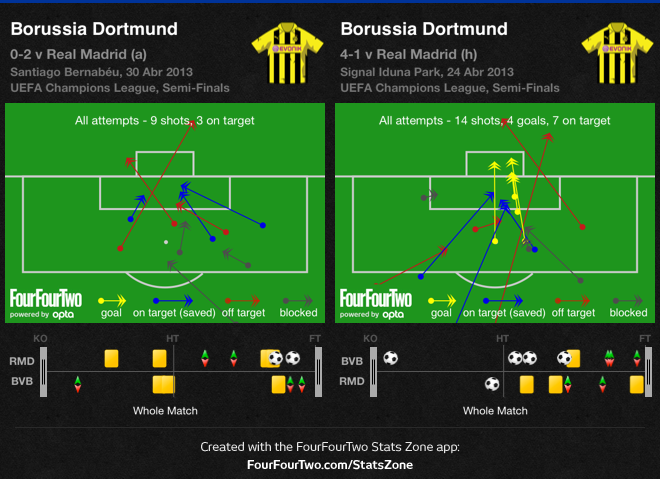 Instead of the first leg's timid counter-attacking moves, Real Madrid managed to penetrate Borussia Dortmund's defence several times, especially during the first 20 minutes. This time around, Real Madrid clearly tried to exploit a perceived weak link in the German side - the left side of their defence. This attempt to punish Borrusia Dortmund down Real Madrid's right was facilitated by Higuaín and Özil's moves - the Argentinean striker drifted right and took his marker with him, with the German playmaker taking the space vacated by his team-mate. This also freed Ronaldo to come inside and shoot with his right foot. One of the main differences in this version of Real Madrid was the pint-sized Luka Modric. Here, the Croat showed all his usefulness and proved crucial to help his team when Xabi Alonso was stifled (Jürgen Klopp's main concern, way ahead of Ronaldo, in his own words). Compared to Khedira, it is possible to see how the former Spur's approach is much more hands-on, without losing the necessary defensive bite. Still (and despite the final score), Real Madrid struggled to make an impact on the match after Borussia Dortmund stopped being tempted by the high-speed transition game. In fact, were it not for the goalkeeper Diego López, the German finalists could have solved the tie much sooner. Real Madrid's gung-ho approach almost backfired spectacularly, but it ended up yielding two goals and a nervous finish to the match.